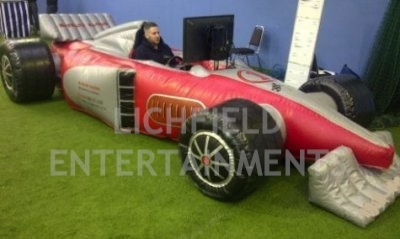 Above is our full size inflatable race car simulator. This is a great simulator for all events but especially those in venues where access is an issue. Whether it has to pass through a single door or get to the second floor of the building it's all possible with this version as it's inflated and built up when in situ. 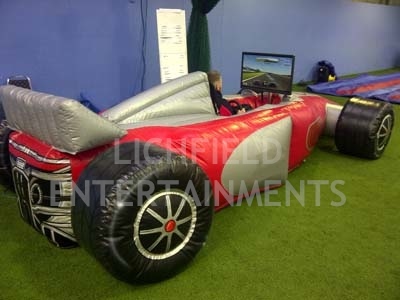 This race simulator is a great attraction for corporate and promotional use and is the perfect attention grabber for showroom events. The simulator requires a floor space of 18x8ft. 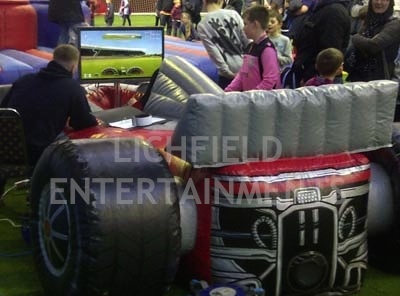 If you have any queries, questions, or would like to hire our inflatable Race Simulator for your event please call us on the number below or click to enquire and we will do all we can to help.